Students from Liberty, Auburn, and Indiana Wesleyan recently joined our volunteer teams to help families recovering from devastating tornadoes. Edward Graham was also in Alabama, encouraging the students as well as storm victims. Liberty University students gear up for a day of chainsaw work in Lee County, Alabama. Homeowners had only a few minutes to find cover before an EF4 tornado—and a dozen other twisters—touched down the afternoon of March 3, tearing through communities along northeastern Alabama’s rolling hills. Many emerged from the traumatic event to find the storm had ripped apart all of their possessions. Twenty-three people lost their lives. 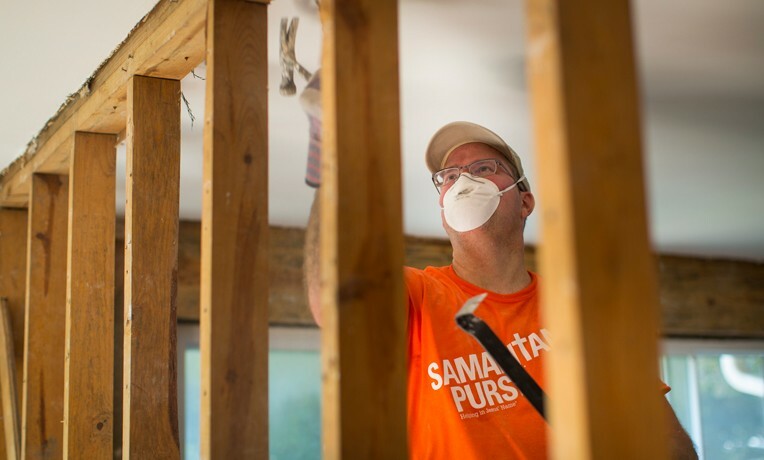 Samaritan’s Purse has deployed more than 1,300 volunteers to the devastated area, including more than 100 university students who spent their spring break helping homeowners in Jesus’ Name. A number of schools were represented at worksites, including Liberty University, Auburn University, and Indiana Wesleyan University. Volunteer teams cut and cleared debris from properties and helped search for precious keepsakes lost in the rubble. Edward Graham, son of Samaritan’s Purse president Franklin Graham and a former Liberty University student, met with some Liberty students who were serving in Alabama through the university’s LU Send NOW program. Edward Graham, son of Samaritan’s Purse President Franklin Graham, meets with disaster relief volunteers from Liberty University. “It’s a missions-focused university, and they’re out here proclaiming the name of Jesus Christ,” Edward said of Liberty, the school he attended before his years at West Point. Liberty University student Leah Castlebury served at Karon Henderson’s home and was privileged to present her with a Billy Graham Study Bible after completing work on the property. Multiple university groups spent their Spring Break helping Lee County, Alabama, homeowners like Karon Henderson. Baseball, softball, and track and field athletes, as well as Cru students, from nearby Auburn University also joined our volunteer teams last week. Butch Thompson, the school’s head baseball coach, said it was an opportunity for his players to build skills of service off the field. Edward also met with homeowners and local government officials. Homeowner Krystal Garrett described the violent storm and her subsequent grief over the deaths of her father, mother, and brother. They lived close by and were an integral part of her daily life. Nearly every homeowner we have assisted lost a friend or family member, or knew someone close to the victims. Several families in the area lost multiple loved ones, and four children were among those killed in the storm. Please continue to pray for grieving communities in Lee County, Alabama, and for our volunteer teams as they serve as the hands and feet of Jesus. More than 1,400 volunteers have served in northeastern Alabama and helped nearly 100 homeowners with clean up and recovery. Our response in Lee County will come to a close this weekend.